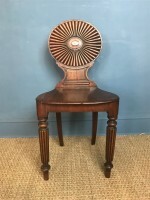 A Regency mahogany hall chair circa 1820 with fan back in the style of Ince and Mayhew . 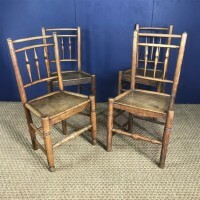 A pair of Irish oak Library Chairs Cork circa 1850 in the Mannerist Revival style of Anthony Salvin of great scale in good solid order ready for recovering. 31 inches wide 34 inches deep 44 and 45 inches high respectively. 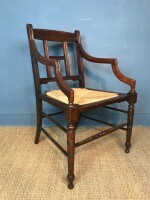 A George 111 oak corner chair circa 1820 with the original drop in leather seat. 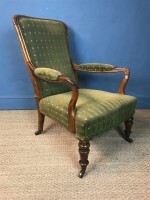 A large George 111 Chippendale period mahogany armchair circa 1770 in excellent solid condition with drop in seat on square chamfered legs. 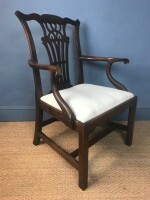 An Aesthetic Movement walnut chair circa 1890 in the style of E W Godwin with rush seat in good solid condition. 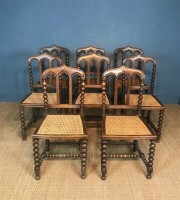 A set of 8 Victorian Gothic dining Chairs circa 1880 with cane seats all in good condition and with bobbin turned stretchers. 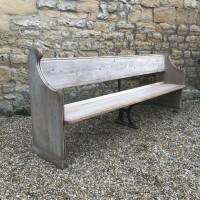 A large Victorian bleached pine bench or pew circa 1890 in lovely dry timber and in excellent solid condition. 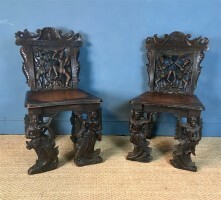 A pair of Anglo Indian carved teak Hall chairs . Bombay Presidency circa 1890 crisply and ornately carved with Hindu Deities . 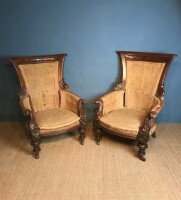 A grand and exotic pair of chairs. Minor differences to the front frieze and one seat slightly dished. 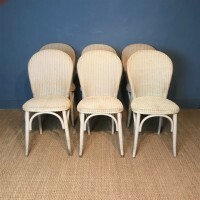 A set of 6 Lloyd Loom Chairs circa 1930 from the original Betty`s Tea Rooms in Harrogate in excellent solid condition with some rubbing to the paint as one would expect. 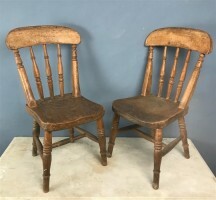 A pair of West Country painted elm childs chairs circa 1880 in lovely original condition . Solid with a nice crusty finish. 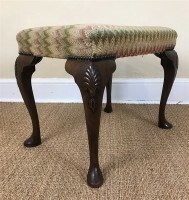 An Edwardian mahogany stool circa 1910 in George 11 style with original needlework top on shell carved cabriole legs and pad feet. 22 inches wide 16 inches deep 18 inches high. 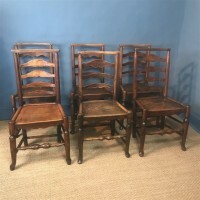 A set of 6 Cheshire Elm and ash ladderback chairs circa 1830 with solid seats on turned legs and pad feet. A pair of Victorian walnut cabriole leg stools circa 1880 in good solid condition with no breaks. 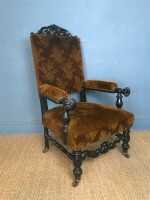 A large Victorian mahogany spoon back chair circa 1890. The beech frame legs and castors in excellent solid condition and the underlying upholstery in good order for recovering. 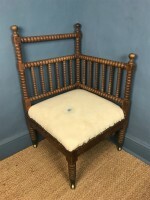 We offer a full upholstery service to the buyer of this chair and can quote on this and any fabric required. 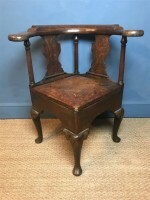 An unusual Aesthetic movement walnut and leather desk chair c 1880 in the style of George Faulkner Armitage with the original pressed leather and brass studded back and seat. In good solid condition a stylish and comfortable desk chair.